Interactive Writing Book Study Ch 1 & 2! Let’s look at the book Interactive Writing Across the Grades as part of our blog book study. See how to engage young writers through explicit writing instruction. You can view this professional read on Amazon by clicking HERE (affiliate link). Students write about the experiences they all have shared in. It might be a book, a field trip, a subject of study (like science or social studies), or fun classroom activity. The teacher teaches about craft and conventions with every piece. The writing that is done is well structured from beginning to end. A variety of writing forms is produced. The teacher selects words that will improve meaning and strengthen vocabulary. Sentence variation is introduced so the complexity of the writing is developed. Spelling, grammar, and punctuation are conventional. Layout issues are reinforced: neat handwriting, concepts around print (spacing), editing and corrections occur immediately, and illustrations elevate the writing. The text is written at a level that is grade level appropriate. Here is an example of the interactive writing we did in my classroom in response to the book The Snowy Day. This is part of our Guiding Readers units. These daily interactive writing opportunities are perfect since they center around a shared experience. In this case, our close reading! I loved all the grade level examples that were shared on pages 6-13! I am always asking myself, “What does this look like in kindergarten?” The authors must know me well because the examples and analysis are so helpful! Why we teach interactive writing? The components of interactive writing. 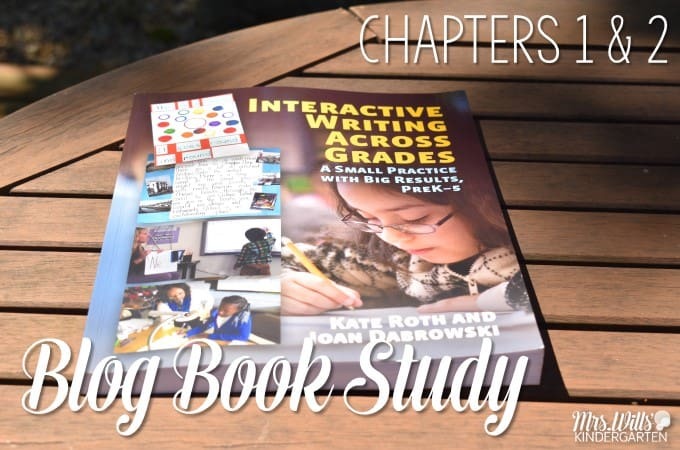 Chapter 2 walks us through the various components of interactive writing. Page 16 has a fantastic table that is a quick reference. You can read more about these ideas on pages 17-18. Interactive writing sits in between the gradual release of responsibility model. You can read a post about Balanced Literacy by clicking HERE. Next week, we will look at chapters 3-5! Please feel free to share your thoughts on chapters 1-2. If you have created a blog post with your reflections, I would love to read it, so feel free to add a link to your post in the comments. Talk to you next week! 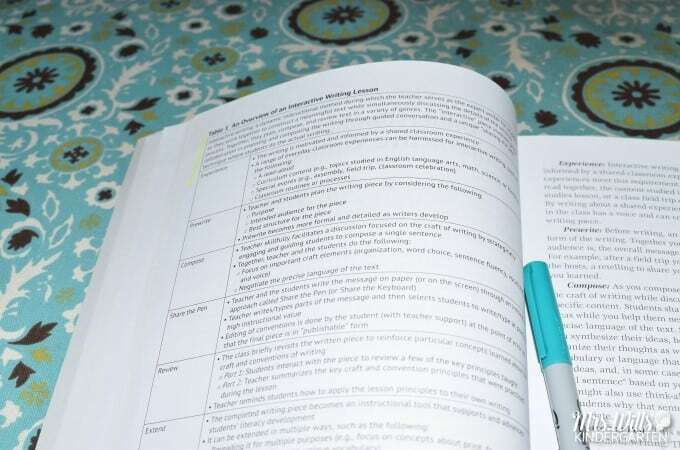 Catch up on this book study! I am sad that I still have no shipping date from Amazon. Ugh! They are usually so good. This is a wonderful book! I love the concrete examples of using interactive writing across subjects. I teach First Grade and am excited about using Interactive Writing in a variety of ways this coming school year. As a K teacher I am not a stranger to interactive writing (share the pen), but as I read through the Intro and Chapters 1 & 2, I realized I could be much more purposeful and explicit in this practice. 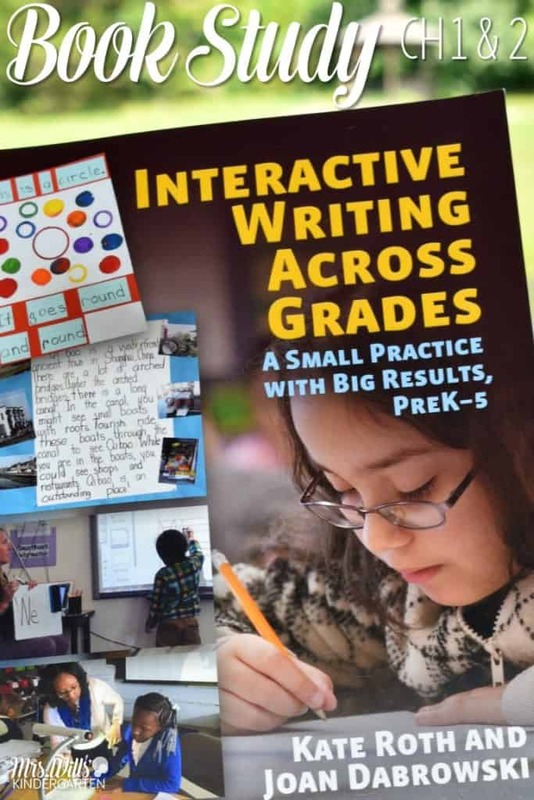 I love that the authors provide a framework to follow (without a script) and stress that interactive writing is one piece of a balanced literacy program. For my kinders I can see that interactive writing provides a safe environment to take risks as a young writer. Everyone can successfully engage by sharing their thoughts and the pen. Everyone’s part of a bigger whole. That’s powerful for littles who may feel isolated and lost as they work independently on their writing, facing that “blank page”. (Katie Wood Ray) The authors reference the “safe environment” at the end of ch. 2 when speaking of ESL students. K’s face similar issues. On page 19 a teacher shares- “I like that my students experience writing from the beginning to the end of the process.” I agree. I can see that interactive writing could allow K’s to participate in editing for content, conventions, word choice, spelling, etc. in a real piece of writing, but in that “safe environment”. 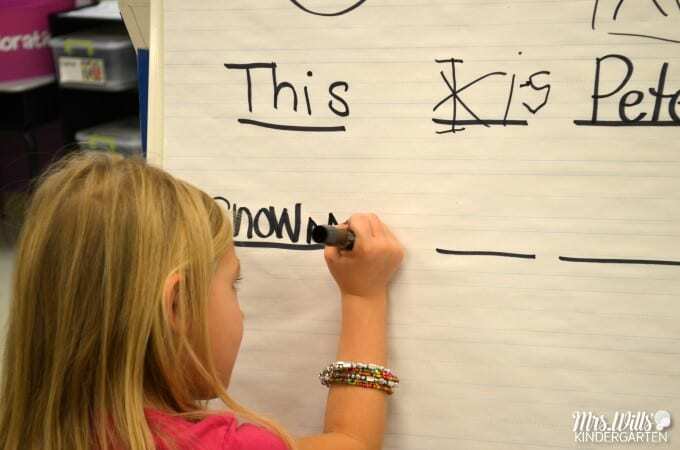 For K’s it’s not a matter of teaching these skills to mastery, but a daily exposure to this editing and thinking would begin to build a foundation of awareness of these writing skills and expectations. Students will take from it what they can according to where they are developmentally. My last thought is- how great are these interactive writing pieces displayed in the classroom going to be for encouraging and empowering young readers/writers!?! I can see my kids “reading the room” with great confidence and a wonderful sense of ownership. I totally agree, Sandi!!! AND Yay! You got your book!